We couldn't be happier to be affiliated with these fine organizations. NCIA's mission is to promote the growth of a responsible and legitimate cannabis industry and work for a favorable social, economic, and legal environment for that industry in the United States. The National Cannabis Industry Association was founded on the principle of power in numbers. The thousands of American businesses involved in the state-legal cannabis industries represent a tremendous economic force in this country. As the industry’s national trade association, NCIA works every day to ensure our growing business sector is represented in a professional and coordinated way on the national stage. HLG is a leader in providing professional services to the cannabis industry, which is comprised of the industrial hemp industry, the regulated marijuana marketplace, their ancillary service providers (finance, capital markets, compliance, etc. ), and their international counterparts. Founded by cannabis industry veterans, Elevate Northeast is dedicated to eliminating the stigma facing our favorite plant and its enthusiasts and patients. Promotion of social equity in the cannabis industry is amongst this organization's core values and Blake M. Mensing is proud and humbled to be a Founding Member of such a needed voice in our nascent industry. The Massachusetts Recreational Consumer Council (MRCC), continuously works with local and state governmental bodies to ensure the safety and well being of recreational marijuana consumers, marijuana businesses, and the general public. Blake M. Mensing served as the Co-Chair of the Advisory Committee tasked with establishing the BBA's educational curriculum for its first cannabis law event, which was held on November 1, 2018 in front of a sold-out crowd. Blake also presented a crash course in Massachusetts cannabis law to a group of area law students at the BBA’s first such offering on December 10, 2018. The BBA is committed to providing the highest quality educational platform for the myriad legal practice areas that cannabis law encompasses and has a commitment to diversity, in thought and demographics, that The Mensing Group LLC wholeheartedly supports. Attorney Blake M. Mensing is proud to be a contributing editor to the Cannabis Law Digest, which is unique in that it gathers cannabis related court decisions from federal, state, and local courts, as well as from zoning boards and regulatory commissions. Subscribers are then provided with easy to understand summaries of the decisions so they know how the courts are interpreting laws and regulations governing the industry. Every summary has been edited and approved by attorneys practicing in the industry ensuring that subscribers receive a quality product that satisfies rigorous standards. 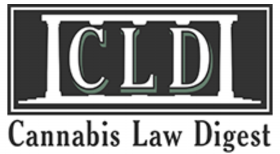 CLD continuously monitors the courts and regularly adds cases so that subscribers are always up-to-date on cannabis law. The Cannabis Law Digest is dedicated to empowering cannabis businesses by providing subscribers with resources to help their businesses and the industry succeed.